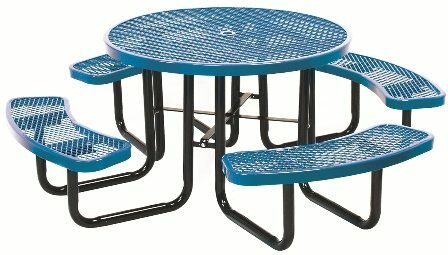 Outdoor School Furniture carries an excellent selection of picnic tables. All of our tables are made from heavy-duty galvanized steel and coated with a thermoplastic finish. They are ideal for a variety of outdoor applications, such as schoolyards, parks, home patios, and more. We offer square, oval, and round tables with attached seating, and we also offer pedestal tables with coordinating chairs. Many of our tables come in three mounting styles: portable, surface mount, and in-ground mount. We also carry optional accessories for our tables, including umbrellas, leg protectors, and skateboard tabs. You are sure to find umbrella picnic tables here in a style and color that is just right for you! Umbrella Picnic Tables made from Heavy Duty Galvanized Steel.